A simple Minecraft mod that speeds up leaf decay after you cut down the wood in a tree. By default it will only take about five seconds before all leaves are gone. Download the source code from GitHub, or get the jar version from the Files tab. Only servers need to have this mod, so if you're playing on a server that has it installed you will not need to install it on the client. None tested yet, will probably work with most mods. Mods that haven't been tested should not pose any issues. 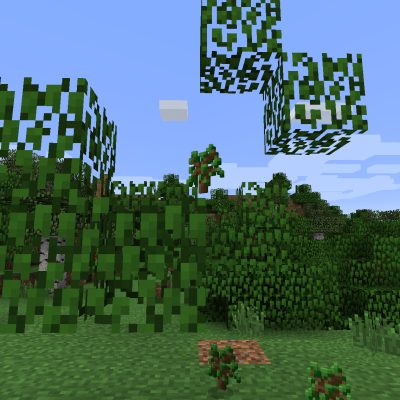 If those mods add trees that are related to the vanilla Minecraft trees, their decay will be sped up as well. Other mods that don't inherit the Minecraft leaves functionality (such as Thaumcraft) will not work unless I specifically support them. There are currently no known compatibility issues with this mod. Feel free to add this mod to your pack. No permission required! I would appreciate a line in the comments though. What is the difference between FastLeafDecay-v14.jar and FastLeafDecay-v15.jar please ? Cheers, I updated the description. Is it possible to add support for Aether 2 trees? I will be using this in my modpack because I literally can't live without this mod. Makes things so much easier. I will be giving a direct link to this mod in my 'Modpack Permissions' page. Thanks for the reminder! I updated the mod. For some reason this mod doesn't want to work on my server. The error report doesn't give any useful information. 1.3.2 seems like a mess, half the mods that claim to be 1.13.2 don't appear to work, unless I'm doing something completely wrong. Sorry to hear that, 25toten10953. I just tried it with forge-1.13.2-25.0.103 and it worked fine, both with Forge installed on the client and with a vanilla client. Did you try with just this mod installed? with biome Douglas Forest works fine! Could you add compatibility for the Tropicraft mod and its trees? Will be included in my modpack as well. Thank you! You've probably heard this already but forge for 1.13.2 indeed has now been released.